Berry Pool first appears in the census of 1820. There is only one male, age bracket given as 16- 25. Also enumerated is one female in the age bracket 16-25, which fits with Bessie Poole Lamb's assertion that Berry married Mary Blackstock in 1820. She would have been 19 in 1820. The 1820 census has one female under 10 in Berry and Mary's household. If the girl is their child, it probably is Jane, since Bessie Lamb supplies no date of birth for the eldest child Jane. Given that the census was taken on August 7, 1820, there is a possibility that Jane was born prior to their marriage or that the marriage date is erroneous. This is echoed in the 1850 census, where Jane (now married to a cousin, Berry P. Jr.) states her age as 31, for a birth year of 1819. When Berry was born in 1792, Eli Whitney was designing his cotton gin, gaining a patent in 1794. Kentucky had just become a state. When Berry and Mary began their family, James Monroe had just won re-election to the Presidency. He had appointed John C. Calhoun as Secretary of War. Major issues of the day were the admission of Missouri as a state, and Monroe's warning to England, Spain and Russia to refrain from encroaching on America, which later became known as the Monroe Doctrine. ...my several children (viz.) Jane Pool who intermarried with Berry Pool Jr., Elizabeth who intermarried with William Rose, Allen Pool, Mary Pool, Martha Pool, John Terry Pool, George Berry Pool, Martin Bobo Pool, Seena Priscilla Pool. 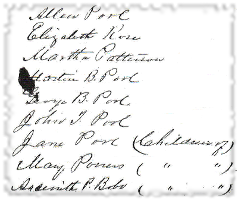 By the time the estate came to be divided among the children in 1879, Jane, Mary, and Ascenith were deceased, as shown by the notation "(children of)" in the Probate papers. Berry had a number of scrapes with the law, one case resulting in a sentence of "let the defendant be imprisoned one week and pay a fine of ten dollars".4 Berry most likely served his sentence in the recently completed Laurens County Jail built between 1826 and 1828, which was designed by architect Robert Mills. The Jail continued in use until the late 1980's. Mary was born 14 August, 1801, the daughter of William and Mary Blackstock. A Revolutionary War battle was fought 20 November, 1780 on the Blackstock Plantation, located on the North side of the Enoree River in present day Union County, SC. In 1840 Berry was appointed the Trustee for the children of his deceased sister Anna Pool Cottrell.5 He oversaw the distribution of her share of the Estate of Seth Petty Pool. 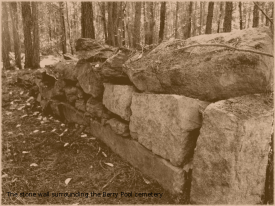 Berry was buried on the family farm, in a private cemetery. This cemetery still exists, and although years of neglect have caused quite a bit of damage, most of the markers are still legible. The page The Berry Pool Family Cemetery has more information about this cemetery. In addition, the Maps & Photos page has additional photographs of the gravesite taken in 2011. A short document about the cemetery is available for download here. Mary continued to run the Berry Pool farm after his death. Her farm is enumerated in various State and Federal Agricultural Census Schedules. The 1850 Federal Census Agricultural Schedule shows her possessing 250 acres of land, 8 horses, 3 mules, 3 milch cows, 2 sheep, 50 swine and 5 other cattle. Mary produced 182 bushels of wheat, 500 bushels of corn, 100 bushels of oats and 50 bushels of sweet potatoes. Her cotton production amounted to 30 ginned bales at 400 pounds/bale. Butter production of 350 pounds and 25 pounds of beeswax were recorded. The value of slaughtered animals was put at $80, and on- farm manufactures were valued at $40. In addition to the above I return that I sold on the same day One hundred & thirty eight (138) acres of land for $2725.00 and sixty seven acres & one half for $775.00 ...but the widow who was willed a lifetime estate became dissatisfied and that Executor who was the purchaser allowed her to retain the said land under the advice of his Counsel and she is still in possession of said real Estate. 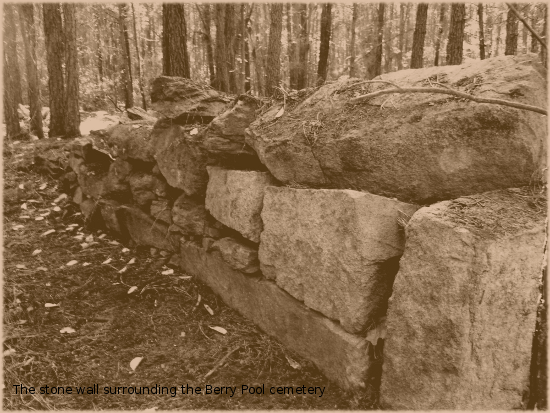 The document Berry Pool and Family of Laurens County, South Carolina contains the results of my research into this family. Please view the pdf. 1. Laurens County Probate Court, "Laurens County Ordinary/Probate Judge Index to Estate Papers 1800-1939" Box 104 Pkg 19. 2. Unpublished records of the Upper Duncan's Creek Baptist Church (now Langston Baptist), Laurens, SC. 3. Laurens County Probate Judge: Inventories, Appraisements and Sales 1897-1929, pp. 186- 187. 4. Laurens County Court of General Sessions, Indictment No. 608. 5. Laurens County Ordinary/Probate Judge: General Estates index (Guardian and Trustee Returns, Equity Estate Records, A-1, C-1, D-1 and Will Book A), TR18. 6. Laurens County Probate Judge: Inventories, Appraisements and Sales 1897-1929, pp. 186- 187.